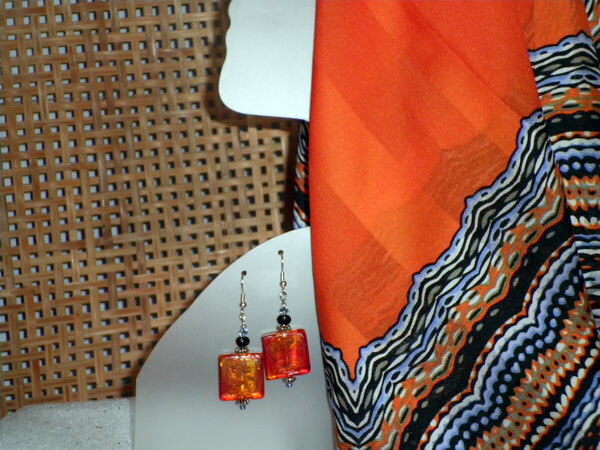 The scarf is a 21 x 21 square in orange, black, white and periwinkle and taupe. The border, which can't be seen in the picture, also has some deeper red orange. The earrings measure just over 1 1/2 inches from the finding loop. The focal bead is a beautiful square glass foil in varying shades of orange. It is surrounded by silver spacers and is topped with a fully faceted black glass disc and a pale blue glass bicone.